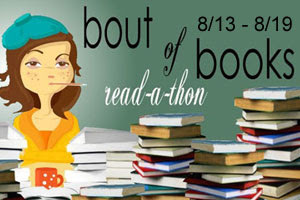 This will be my first time participating in Bout of Books Read-a-thon, and I'm really excited! I figured since it starts the 13th and 2 of my 4 reading challenges end the 12th, it's a good chance to stay motivated and continue to get caught up on some reading. I will be reading all week! My goal is to read 4 books, and these are the books I'm choosing from. I'm sure I'll change my mind, hence the options. GOAL UPDATE: Since I was already partway through Hemlock and Meant to Be when the challenge started, I can't count those as 'whole' books, so I'm going to have an overall goal of 800 pages. Thoughts: Really enjoying both of these books. Everyone is raving about Meant to Be, and although I'm enjoying it, I don't think it's amazing. It's being compared to Anna and the French Kiss but I LOVED Anna, and I'm just not feeling that way about this one. 106 pages is good for me because I'm slow, but I could have read more if I hadn't been revising book #2 (those pages should totally count because I was reading them, even though it's my own writing), and the Twitter chat (which was super fun! ), and then I went to bed about three hours earlier than normal because I didn't feel great. Hopefully today will be better! Books read: I finished Hemlock and Meant to Be, both of which I started before the R-A-T. Challenges: I didn't participate in any today; I just wasn't feeling up to the extra effort because I'm so tired! Thoughts: Hemlock and Meant to Be were both really good. I'm happy with my progress for today. Tomorrow I think I'll start Nick and Norah's Infinite Playlist (physical book), and Love and Other Perishable Items by Laura Buzo (ebook). Thoughts: Boooo for today's reading. I spent most of the day cleaning, then did a bit of blog surfing, then started my book and put it aside to watch a couple episodes of Castle because I hated the book from the first page...then right before bed I tried the book again and just as I thought I might not hate it, I had to go to bed because it was 1:30. So. 37 pages. I did do both challenges though and they were both time consuming, so that's something! Books read: Finished Nick and Norah's Infinite Playlist, and got about 10 pages into my next book, Robin Hood by Enid Blyton. It wasn't on my original list, but oh well! Thoughts: I'm pleased with the amount of reading I got done today, especially since I didn't get much done yesterday. I feel like I'm moving along nicely toward my goal. Nick and Norah's Infinite Playlist ended up being better than I originally thought - I wrote my review last night (although it won't be posted for awhile - I'm about a dozen reviews behind after my month-long Canadian Spotlight event in July), and I gave it 3.5 stars. I really wanted to put my own book (Blue Sky Days by Marie Landry) in the summer slot (hey, I think it's a decent summer read *wink*) but I refrained! Challenges: Book Spine Poetry - a lot of fun! Thoughts: I'm pleased with the reading I got done today. Heat Wave is short, so I should be able to finish it tomorrow. Thoughts: 215 pages - yay! I spent a good chunk of the day reading. I went to the library and sat and read in my favourite chair, and then came home and read for quite awhile. I finished both the books I was reading, and I think I'll finally start Pushing the Limits by Katie McGarry tomorrow - very excited about that one. Thoughts: I can't believe today's the last day of Bout of Books! I've had so much fun and met so many wonderful people, plus I got a lot of reading done. As for thoughts on Pushing the Limits, it's as good as everyone says it is, and I'm really, really enjoying it. I wanted to keep reading last night but had to get to bed! Thanks so much to everyone who's dropped by to leave comments, and chatted with me on Twitter, and thank you to the hosts of Bout of Books, along with everyone who hosted such fun challenges for us! See you guys next time! I like your tentative list! I recently listened to the Sisterhood 1 audiobook. So good! Best wishes on the read-a-thon! Great list and I'm so glad you decided to join us. Have fun and good luck! Yay! I'm glad you're participating! And what great reads ... you're going to LOVE The Sisterhood of the Traveling Pants! And Meant to Be is one I need to read soon! Hey i'm doing this read a thon too :). And i'm a new follower ! I haven't read any of these books except for the Sisterhood of the travelling pants series. I read the french translation of this series (i'm french) and I loved these books <3. I've read last month the final book Sisterhood Everlasting and it's one of my favorite book of the year. I hope you'll like them ! I'm really looking forward to finally reading Meant to Be, so I hope you enjoy it! I'm so excited you are participating this time Marie!! You also have an awesome sounding list of books to read! Is this your first time reading Sisterhood of the Traveling Pants? its a wonderful series. I also CAN'T WAIT to read Meant to Be - it sounds amazing :) good luck on your goals Marie! *gasp* Is this your first time every reading Sisterhood of the Traveling Pants? I love that series! I can't wait to see what you think of it. Thanks for stopping by Pages of Forbidden Love! I have Meant to Be on my Kobo ... I can't wait to read it! I didn't know it was being compared to Anna ... I LOVE Anna. :) Though, I'll be sure to go into it with a fresh pair of eyes! I hope you are feeling better today! I agree, pages read for revising your book should count! :) Good luck with the rest of the week and have fun! Love and Other Perishable Items! That one looks sooo cute. :) I wasn't the biggest fan of Nick & Norah, but hopefully you like it. Great list of books. I had a little problem with Heat Wave books, being such a fan of the series. The are good, but not great. The biggest annoyance is re-learning all their different names. Cutie graphic for the Seasons Book Challenge. I usually end up starting part-way into a book as well, so the page count is a great idea and I've been using it the last few readathons :)Good progress so far, and I like your choices for the Seasonal challenge! You're still making great progress! Happy reading! I loved reading the sisterhood books. I need to read Megan's books because i have been hearing great things about the series. Funny I was trying to figure out a way to include Heat Wave in my Haiku too! Great job! Heat Wave fit nicely in those YA books for your haiku. 878/800 pages -- Nicely done! Congrats on reaching your goals! Great job! Glad you had a great week. Hope to see you in January at Bout-of-Books 6.0!